Providing alternative education for 11 to 18 year olds within the picturesque setting of a 300 acre farm located in Whitbourne with easy access from both Hereford and Worcester. There is always something new and interesting to do, observe or learn about. Find out about some of the tasks that go into making up our day. Having grown out of our current base we have big plans to build a new, sustainable headquarters. Take a look at the plans and watch our progress. 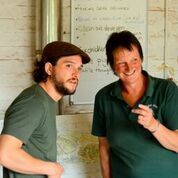 Our charity patron, Kit Harrington is helping us to raise funds to build our new headquarters and improve our facilities.